After the move of MoniQA’s Secretariat into its new offices in Neutal, Austria, about 50 km South of Vienna Airport, the association’s headquarter has become fully operational in its new location in the Regional Technology and Innovation Center Burgenland. Besides the administrative offices, facilities for small workshops and meetings can be arranged. Please be reminded of our new contact details. Visitors are always welcome! 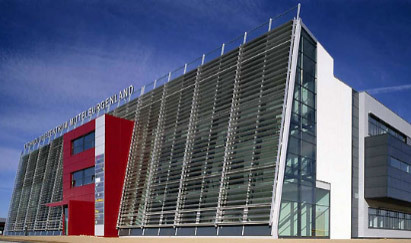 We are pleased to announce that our headquarters in Neutal has been appointed with a new secretary. 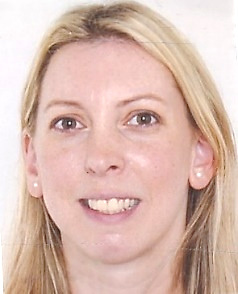 Marion Forgash joined MoniQA in April 2016. She is looking after MoniQA’s membership as well as general administration. It is a great pleasure to announce the following new members within MoniQA who have joined the association in 2016. We would like to offer a warm welcome to our new member institutions and we look forward to having your expertise and knowledge on board. 4. Not a member yet? Sign up today! Membership in MoniQA Association is open to all institutions interested in food safety and quality related issues. MoniQA – the International Association for Monitoring and Quality Assurance in the Total Food Supply Chain is an international and interdisciplinary network of professionals from institutions working in food research, regulatory bodies and trade, providing solutions to promote a safer and secure food supply worldwide. MoniQA facilitates international research collaborations to enable services and products for food safety & quality assurance, progress and validation of analytical methods, training and continuous professional development, consultancy and socio-economic impact assessment. Sign up for Membership in MoniQA today and start benefiting from the association’s international network and a variety of activities and services www.moniqa.org/about/association. In 2016 MoniQA has facilitated participation of its network in several collaborative research project proposals. MoniQA Association is also actively involved in 5 different project proposals which may be funded by the European Commission’s Horizon2020 Programme. MoniQA participates in the following research projects either as partner, workpackage leader or task leader. SFS-37-2016: The impact of consumer practices in food safety: risks and mitigation strategies, successful through stage 1. MoniQA is Workpackage Leader, a full proposal will be submitted by 13 September 2016. SFS-33-2016: Understanding food value chain and network dynamics, successful through stage 1. MoniQA is Workpackage Leader, a full proposal will be submitted by 13 September 2016. SFS-45-2016: Increase overall transparency of processed agri-food products, unfortunately unsuccessful through stage 1.
the call descriptions to the above titles here (member’s login required). MoniQA participated in 3 different calls for proposals with a deadline of February 2016 under the European Commission’s Horizon 2020 programme. The following proposals have successfully passed stage 1 evaluation and are invited to progress to stage 2. We are pleased to continue our success in expanding our involvement in EU projects. Considering the level of competition and the required excellence of research and impact of EU funded projects we are pleased with the stage 1 approvals which we have received and we would like to thank the coordinators of the consortia for their great efforts and their invitation to MoniQA to lead selected activities. Involvement in collaborative research projects will increase the knowledge base, the network and strengthen MoniQA’s offerings and services for its members and beyond. MoniQA’s first food allergen QC materials, MoniQA SMP (skim milk powder, MQA 092014) and MoniQA BLANK (gluten-free cookie, MQA 082015) have recently undergone a first testing trial with some 40 laboratories involved worldwide. Most of the anticipated results have been collected and are currently evaluated. In a next step the completed materials of dried skim milk incurred in gluten-free cookies at various concentrations shall become available in summer 2016. The materials are a result of an initiative that met in 2013 in Washington, MO, USA, which progressed into a MoniQA Task Force on the development of reference materials for food allergen and gluten-free analysis. The Task Force is an international group comprised of several SDOs (Standardisation Organisations), industry representatives, policy makers, test kit providers and method developers, analytical companies, as well as representatives from various universities. This international group has been working towards consensus on the specific requirements and the design of globally acceptable reference/testing materials for allergen and gluten-free analysis. For this purpose MoniQA has liaised with the EU funded project iFAAM, the Prolamin Working Group, Health Canada, FARRP, Australia’s Allergen Bureau (Vital), and others. 8. Food Allergen Reference Materials: Next Task Force Meeting on 31 July 2016! The next meeting of MoniQA’s Task Force on Food Allergen Reference Material is scheduled ahead of the IAFP Annual Meeting in St. Louis, MO, USA, and will be hosted again by Trilogy Analytical Laboratories (MoniQA Member since 2012) in Washington, MO, USA, on 31 July 2016. Interested parties are advised to contact moniqa [at] moniqa [dot] org. Roland Poms will also give a presentation on the available food allergen reference materials at the IAFP Annual Conference that follows the Task Force Meeting. MoniQA is organizing a two-day-workshop on Food Fraud Prevention and Effective Food Allergen Management targeted toward the food industry/food manufacturers, food production auditors and representatives from the regulatory environment. This workshop will be especially suitable for SMEs (small and medium sized enterprises) and as part of your Continuous Professional Development. The workshop will give in depth insight in innovative approaches, newly developed tools and recently introduced analytical methods to combat food fraud and improve food allergen management. These new developments will be linked to real case studies and learnings from recent scandals. 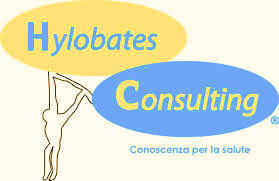 The workshop will be co-organised with the CNR-ISPA (a MoniQA Founder Member) in Bari, Italy. New dates are now confirmed for 26. & 27. January 2017. Roland Poms participated at the 6th iFAAM Consortium Meeting in Amsterdam, the Netherlands, 28 February – 1 March 2016. iFAAM (Integrated Approaches to Food Allergen and Allergy Risk Management; 2013-2017) is the world's biggest ever study of allergies - coordinated by Clare Mills from the University of Manchester www.inflammation-repair.manchester.ac.uk/ifaam and funded by the European Commission’s Framework Programme 7. The MoniQA Association is partner in iFAAM and works in Workpackage 9, led by Paul Finglas (Vice President in MoniQA and Director of EuroFIR AISBL). MoniQA’s current activities focus on the development of online tools for food manufacturers and policy makers to support an improved food allergen management. 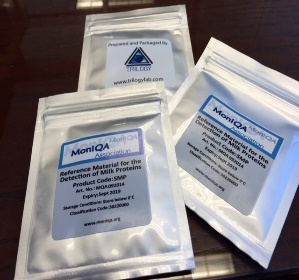 An iFAAM toolbox shall be offered on the MoniQA website shortly. The 7th iFAAM Consortium Meeting is planned for 17- 19 October 2016 in Rome, Italy. In its aim to develop evidence-based approaches and tools for the management of allergens in food and to integrate knowledge derived from their application into food allergy management plans and dietary advice, the iFAAM project works develops a clinically validated tiered risk assessment approach for food allergens. The resulting holistic strategies will reduce the burden of food allergies in Europe and beyond, whilst enabling the European food industry to compete in the global market place. The iFAAM approach is building on e-Health concepts to allow full exploitation of complex data obtained from the work in this project, maximising sharing and linkage of data. Explaining how the integrated risk assessment approach can help to define benchmarks for precautionary allergen labelling and make labels more transparent for all stakeholders. In total, 46 participants attended this workshop, which was co-chaired by Paul Finglas, President and Managing Director of EuroFIR (Brussels, BE), and Roland Poms, Secretary General/CEO of the MoniQA Association (Neutal, AT). A third stakeholder consultation is planned towards the end of 2016 to discuss a more appropriate use of precautionary allergen labelling. MoniQA is official supporter of the 4th International ISEKI_Food Conference to be held in Vienna, Austria, 6 - 8 July 2016 organised by the ISEKI-Food Association (European Association for Integrating Food Science and Engineering Knowledge Into the Food Chain). From more than 500 submitted abstracts 88 oral and 255 poster presentations will be delivered. Poster Awards will be granted, Pre-conference activities (Food Waste Recovery Workshop, a PhD workshop, a free presentation of the FooD-STA centre AUSTRIA and a free training workshop on entrepreneurship) enrich the 4th International ISEKI_Food Conference in Vienna this year! More than 300 people from all continents have already registered. We look forward to welcoming you in Vienna in July 2016! MoniQA endorses and contributes to the First Food Chemistry Conference - Shaping the Future of Food Quality, Health and Safety to be held 30 October - 1 November 2016 in the NH Grand Hotel Krasnapolsky, Amsterdam, The Netherlands. This exciting new conference celebrating the 40th anniversary of the leading international journal Food Chemistry will bring together experts and young researchers from academia, research centres, and industry to debate on the latest scientific advances in the field of food chemistry that help to shape current and future challenges in food quality, food safety, and health aspects of the food chain. These challenges are also intimately linked to the wider EU Horizon 2020 Societal Challenges related to health, food security, sustainable agriculture, maritime research and the bioeconomy. MoniQA endorsed the 15th International Cereal and Bread Congress (ICBC), which was organized by ICC - International Association for Cereal Science and Technology. The meeting was chaired by Hamit Köksel (ICC President Elect) from Hacettepe University (a MoniQA Founder Member). Some 440 participants from around 50 countries attended the event in Istanbul, 18-21 April 2016. Around 150 oral presentations and more than 200 poster presentations focused on cereals and cereal product quality evaluation/quality management, cereal processing technologies, nutrition and health, food safety and security. Roland Poms gave a keynote lecture on iFAAM-Integrated Approach for Food Allergy and Allergen Management – an Update and on behalf of Imprint Analytics (MoniQA Member since 2015) a talk on Authenticity and Traceability Testing by Compound Specific Stable Isotope Analysis – What Has Vanillin to Do with Rice? For more information on the 15th ICBC, pictures and the presentations, please visit the congress web site at www.icbc2016.org. We shall be looking forward to the 16th International Cereal and Bread Congress, which will be coorganized by Lincoln University in spring 2020 in Christchurch, New Zealand. 15. Have you considered publishing in QAS? 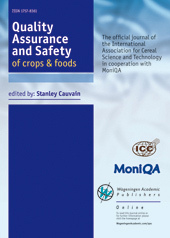 With its strong focus on the development and application of new analytical tools and their potential for quality assessment, assurance, control and safety of foods and feeds, QAS - International Journal for Quality Assurance and Safety of Crops & Foods provides an ideal platform for original research papers, reviews, reports, regulatory updates and short communications in the areas of food safety, food security and sustainability. QAS was jointly established between MoniQA Association www.moniqa.org and ICC – International Association for Cereal Science and Technology www.icc.or.at. Members of both associations enjoy a free online subscription of this international peer-reviewed journal. We value and appreciate your feedback and suggestions in order to improve our services and the way we communicate. Please feel free to send us your thoughts and suggestions to moniqa [at] moniqa [dot] org . Stay connected with MoniQA and enjoy reading this MoniQA eNews Alert 2016-06-30! © 2016, MoniQA - International Association for Monitoring and Quality Assurance in the Total Food Supply Chain, General Secretariat, Werner von Siemens Straße 1, 7343 Neutal, Austria, www.moniqa.org. Email: moniqa [at] moniqa [dot] org .